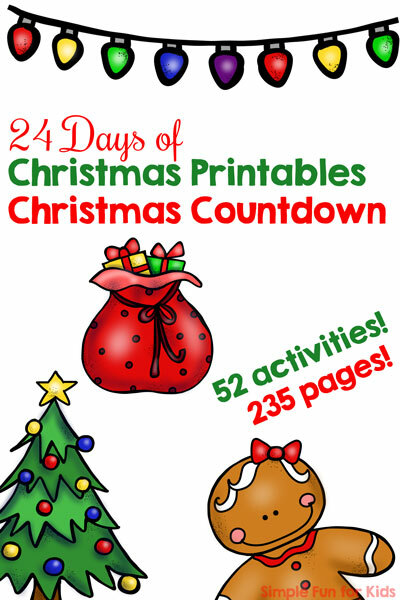 Today is December 21, and that means that it’s not only just a short 3 days until Christmas Eve, but I’m also sharing the 21st printable in my 24 Days of Christmas Printables for Toddlers series! The printable pdf file contains one page to print. It’s essentially a no-prep activity, although it’s a good idea to laminate the page if you’re interested in reusing it. There are six different items of winter clothing on the page: a pair of light blue boots, a turquoise jacket, a hot pink sweater with a snowman design, some pink pants, a dark blue hat with white polka dots, and a white and blue scarf. Discuss the images with your kids, talk about the items, colors, and details, ask them to point out specific items, count with them, and help them mark the correct numbers at the bottom if they’re up for it. Or practice positional words like next to, to the left/to the right, above, etc. 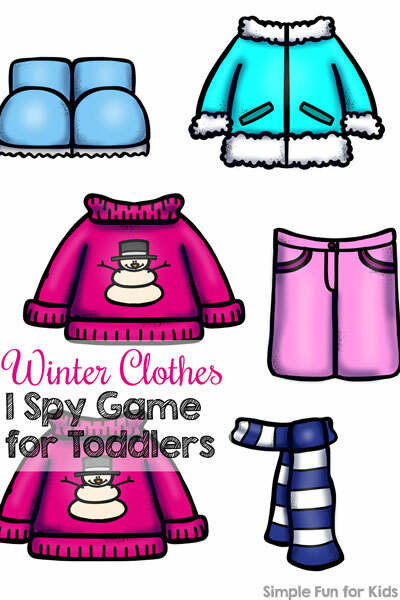 Download your Winter Clothes I Spy Game! My Winter Clothes Counting Clip Cards (1-20) use the same set.